Swedish Rugs – Swedish Rugs and carpets have a long history in Scandinavian weaving which reaches right into the Modern period. 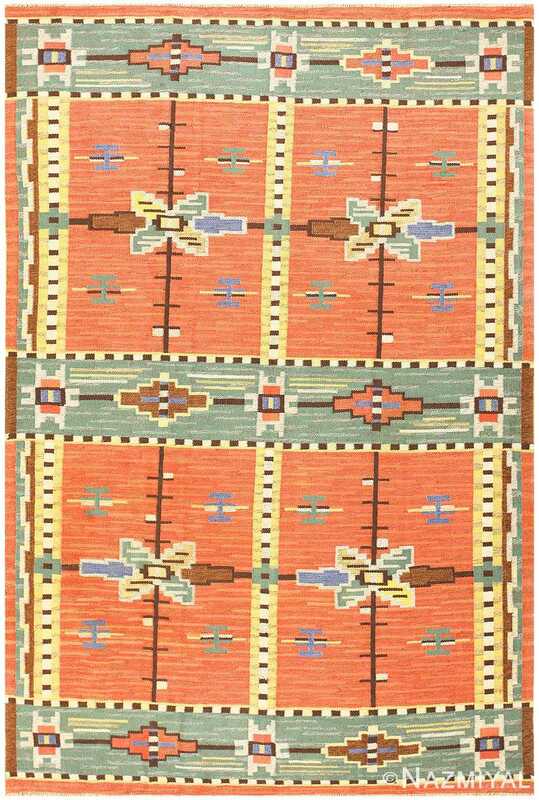 An established form of Swedish folk weaving, “Rollakans” were used as coverlets or flat woven tapestry rugs. Swedish rugs and carpets are the product of ancient weaving traditions transported from countries in the Asian Steppe on epic journeys through harsh Arctic conditions. Evolving from a practical fur-like cold weather garment into a stylish coverlet, the Rya was the premier all-purpose textile for the Scandinavian region. After many years of creating long-pile Ryas and flat-woven carpets, Swedish weavers developed a passion for designs incorporating simple geometric patterns and artful motifs based on regional folklore. 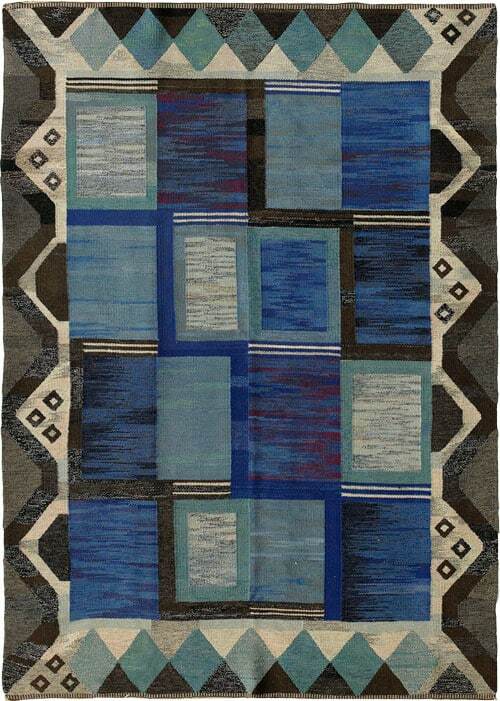 By the 20th century, Swedish rugs were international art objects that were partly the product of government funding. Swedish master weavers and textile artists continued to grow their trendsetting style with shaggy carpets, bold works of art and colorful rugs that epitomize modern, mid-century designs. 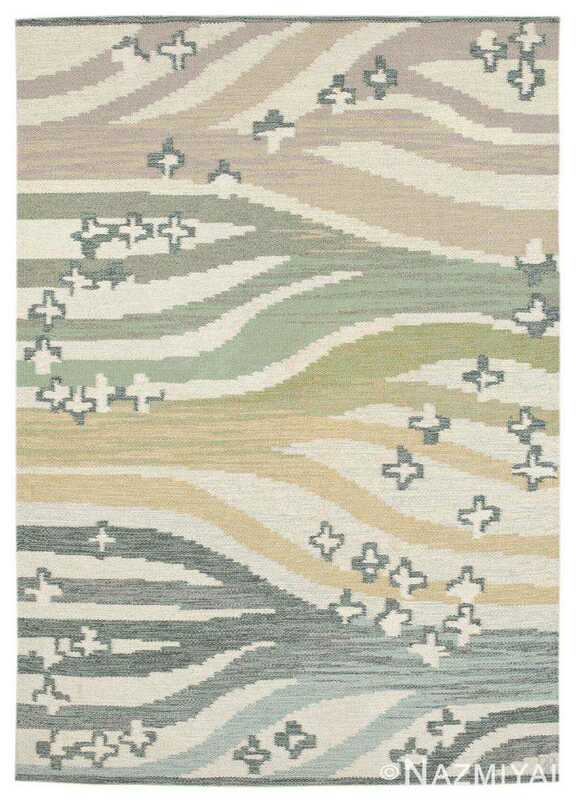 Vintage Swedish rugs and carpets have been the benefactors of the recent resurgence in mid-century modern interiors. Rugs from Sweden are known for incorporating modernist motifs and designs which naturally go perfectly in any modern decor or setting. As the demand increases for the art deco and vintage rugs – people can expect the prices of the Swedish rugs to escalate over the next few years. With that said, Swedish rugs and carpets are probably the best value – simply put – for a fraction of what it would cost to get a good (not great) mid-century modernist painting, one could buy any one of a number of the best Swedish rugs that ever made. It is because of this simple fact that people are now buying Swedish rugs and using them as wall hangings / tapestries. There is no doubt that the Swedish rugs and carpets have equally as much artistic value as any painting but since the price points are so much less this begs the question – why buy a modernist painting when you could own a Swedish rug that is equally as beautiful and is far less expensive? Nazmiyal is pleased to offer collectors, designers and carpet enthusiasts a comprehensive collection of vintage rugs, textiles and art pieces from Sweden. Nazmiyal searches the world to procure the best Scandinavian Ryas, flat-woven Rolakans, art rugs and traditional Flossa pile carpets. Created during the mid-20th century, vintage Swedish and Scandinavian carpets embody the creative spirit that emerged at the birth of Modernism. Undoubtedly an offshoot of the Aesthetic Movement, Swedish carpets and textiles represent an industry backlash where mass-produced items were shunned and master craftspeople contributed care and creativity to each piece. Until the late 1920’s, Swedish textiles and carpets were domestic luxury items that were unknown to the world. This changed when the country made a collaborative appearance at the 1925 International Exhibition or “Exposition Universelle” in Paris. The Society of Swedish Homecraft and other government-sponsored organizations united freelance weavers and artists to put their country on the weaving map. Dominated by a young group of artists and master weavers trained in industrial art and design, Swedish weavers and artists upped the ante at an exposition hosted by the Musee des Arts Decoratifs in 1927. This international exposure changed the future for Swedish weavers. Sweden, a country roughly the size of California, is home to one of the most diverse weaving traditions in the 20th century. Swedish weavers had access to a world-class education in the arts that was augmented by their individual artistic instinct. Artists and master weavers, such as Marta Maas Fjetterstrom, contributed hundreds of inventive designs that were manufactured in cooperative workshops while others like Marta Gahn, Brita Grahn, Rakel Callander and Anna Greta Sjoquist worked independently. The legacies left by these celebrated master weavers, designers and artists are profound, and their creations span many styles. Imbued with folklore and Scandinavian symbolism, these diverse textiles and carpets woven by master craftspeople are impeccably made using the finest materials. From the initial inspiration to the laborious process of creating each carpet, the expressive creations of Sweden’s accomplished master weavers represent one of the most comprehensive and diverse weaving cultures. View our collection of modern and antique Swedish carpets to discover the creations of this marvelously eclectic country. The renewed popularity of mid-century design has reinvigorated the desire for Swedish rugs and Swedish Kilim carpets of this vintage and quality so view the collection now before these Swedes leave town! As a nice little side note, the term “antique rugs” in Swedish is: antika mattor.